what a handsome German Shepherd Dog! We call this Odin’s publicity shot and think it should be on a dog food bag or something. He just struck the right pose. This was one of several shots taken when he was 80 pounds and 8 months old. He is will be 7 in Feb. this year and still looks majestic. He is a handsome, good natured fellow and loves people, even the vet. Below is his web site. We just adore him as you can see. Who doesn’t love a GSD. Not looking for any prizes. Just let me know if you think he is as handsome as I do! What a great last name you have btw :) Thank you so much for sending in the great story about your handsome German Shepherd Dog, Odin. What a great and powerful name. He is truly one handsome GSD. And it is wonderful to hear that he is doing so well at 7 years old! If you can, keep him on the light side (weight wise) to help with his joints as he ages and you may want to consider adding glucosamine or another joint type supplement to him in the months to come to help him get around easier. He actually looks a lot like my newest German Shepherd Rodie in many ways. I love the dark colors but so many people are afraid of them when they have dark faces especially. Continued success with him. And if you ever have the chance please feel free to send in some more pictures and another story all about Odin! What a proud momma you are and I have to agree, Odin is a Handsome male! And a name like yours, of course you are a Shepherd lover! 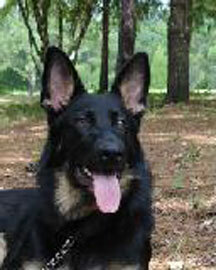 German Shepherds are Amazing, so Protective, Trustworthy, Obedient (most of the time)and Loyal. I wish everyone could experience what we - GSD people have. Take care of your boy and he will take care of you!